This dive includes tanks and weights, and is only for divers who are Advanced Open Water and above. If you like to see big animals this is the dive for you. 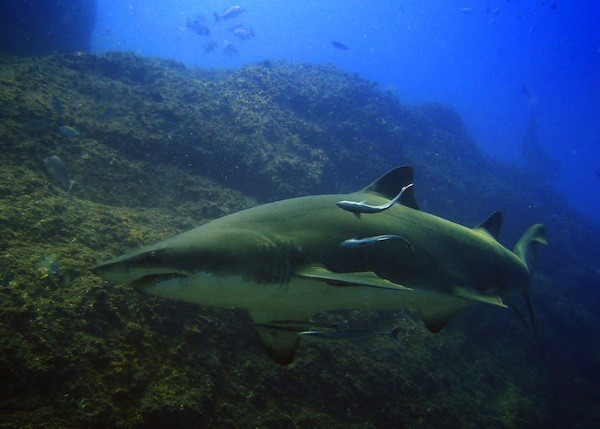 Not only is it home to the critically endangered grey nurse sharks but you will also see a myriad of other marine animals such as Giant Queensland Groper – (these guys grow as big as the sharks), eagle rays, bull rays, manta rays, leopard sharks, 3 different species of turtle – loggerhead, green and hawksbill. During winter we witness the annual migration of the humpback whales. Not only do you see the whales on the surface breaching, tail slapping and waving their pectoral fins around but you will also be able to listen to their whale song under the water. Sometimes their song is so loud that the sound starts to reverberate through your chest – this means they must be very close by! The four volcanic pinnacles that make the site of Wolf Rock are also covered by hard and soft corals providing homes to all the small animals that are the lifeblood of any reef. Nudibranchs, octopus, sub-tropical and temperate species of fish, crabs, sea stars, wobbegong sharks, and more.